Summary from GoodReads: In this companion novel to Anna and the French Kiss, two teens discover that true love may be closer than they think. Why am I looking forward to Lola and the Boy Next Door? Because it's written by Stephanie Perkins! If you haven't read Anna and the French Kiss yet (and enjoy adorable--yet not sickeningly cute--romances) I'd highly suggest that you go pick up a copy! I'm really looking forward to Stephanie's new book since I enjoyed her first book so much and well, I can barely wait! 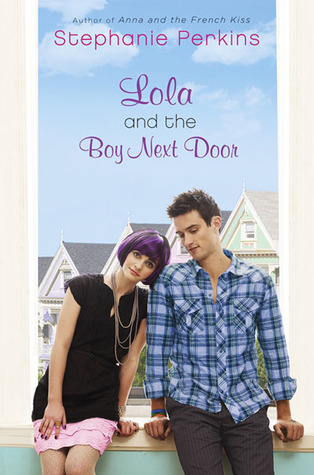 Lola and the Boy Next Door is set for release on September 29, 2011 and is published by Dutton (an imprint of Penguin Group). I haven't even read Anna and the French Kiss yet! I keep waiting for it to go on sale, but I guess it's just too good. I think this one sounds just as cute! Loved Anna and the French Kiss so am quite excited about this one. Great pick! I had the same pick this week. haha. You have amazing taste! Great pick. New follower. I have Anna on my Nook, still waiting to be read. I'm hoping to get to it soon! I love the cover for Lola. So cute!! I still haven't read Anna and the French Kiss but heard only great things about it. Hope this one is just as great! Wow you're the third blog I've visited that has this as a WoW! (And that's just today.) I still have to read Anna and the French Kiss, but I know I'll enjoy it. Then I can pick this one up afterwards. Loooved Anna and the French Kiss can't wait for Lola I think I'm going to love it even more. Yay, now I can follow your blog! Ugh, the google friend thing wasn't working last night. Do you keep changing the design, or am I crazy? LOL. I keep changing mine too. I think I can safely say that after Anna and the French Kiss, I already know I'll love Lola and The Boy Next Door. Great pick! I still need to read Anna and the French Kiss! I know, I'm shamefully behind! This one looks really cute, too.